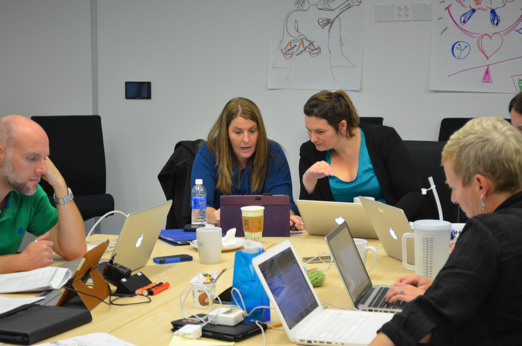 How would you value feedback on curriculum documents you write? Pictured left to right are a few of the Building Quality Curriculum reviewers: Simon Clark, Colleen Mudore and Christine Snow. The Bethesda Global Centre reverberated with high energy during Nov. 12-14, the result of gathering 20 educators to participate in a three-day training session designed to develop a team of reviewers to support the new Building Quality Curriculum service, currently running in trials in 21 schools. The group arrived in Bethesda ready and eager to master their new roles and to help the IB elevate teaching practice in World Schools that elect to focus on increasing their capacity in quality curriculum writing. Trainers Simone Becker, Alex Rankin and Damian Rentoule presented an overview of Building Quality Curriculum, an initiative that is part of the IB’s not-yet-launched School Enhancement Services, and designed to provide feedback on unit planners and teaching practice to school ‘clients’. Rentoule is quick to point out that feedback is a tool that schools can use to take their teaching teams and their school to a higher level of achievement. 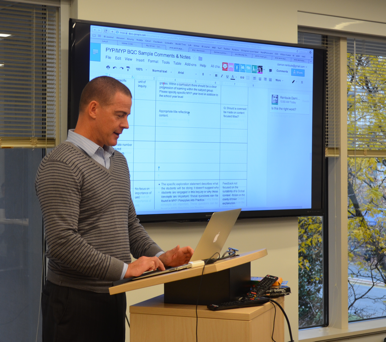 Damian Rentoule leads the reviewer training session, Nov. 14-17, 2014 in the IB Bethesda Global Centre. As someone who was on the ground floor of developing the School Enhancement Services from their inception, Damian is pleased that curriculum feedback is part of the new services the IB is preparing to offer schools. “Feedback to the school as an organization is as important as the feedback that a teacher gives a student in the classroom on a day-to-day basis,” he says. Hear more about curriculum feedback from Damian. Working in teams, the reviewer group took turns moderating and standardizing their feedback, refining and reflecting as they worked through many scenarios. Contributed by staff from the IB Schools Division Communications team.